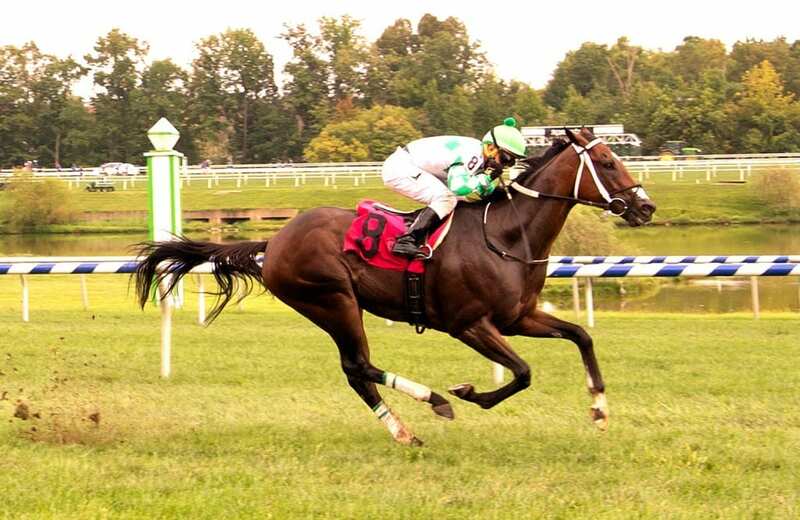 Sheikh of Sheiks won his fourth in a row at Laurel Park. Photo by Jim McCue, Maryland Jockey Club. Team Gaudet’s Sheikh of Sheikhs, a stakes winner at 2 and Grade 3 placed at 3, registered his fourth straight win and third in a row for new connections with a popular 5 ½-length romp Friday, opening day of Laurel Park’s calendar year-ending, 61-day fall meet. Favored at 8-5 in the $45,000 second-level optional claiming allowance for 3-year-olds and up, 5-year-old Florida-bred gelding Sheikh of Sheikhs ($5.20) ran 5 ½ furlongs in 1:03.62 over a firm Exceller turf course. It was the first start for Sheikh of Sheikhs since being claimed for $25,000 by trainer Lacey Gaudet on behalf of the family stable out of a three-quarter-length triumph Aug. 6 at Saratoga. Then trained by Eddie Kenneally, he won his previous two starts in Kentucky for trainer Mike Maker. Jockey Rosario Montanez kept Sheikh of Sheikhs, breaking from Post 8 of nine, fourth while in the clear four wide as Special Intention went the first quarter-mile in 23.11 seconds. Sheikh of Sheikhs swept the lead around the turn and opened up once straightened for home, going a half in 46.57 and five furlongs in 57.73. Sheikh of Sheikhs won the 2015 Juvenile Dirt Sprint Stakes at Keeneland in his 2-year-old finale and was third in the 2016 Hutcheson (G3) at Gulfstream Park in his sophomore debut. He owns six wins and $253,922 in purse earnings from 16 career starts. In Friday’s co-featured races, Renaissance Rosie ($4.60) stretched her win streak to three racing first time off the claim for trainer Gerald Brooks with a 1 ½-length triumph as the favorite in Race 6, a $45,000 second-level optional claiming allowance for fillies and mares 3 and up, running six furlongs in 1:10.10, while Bellerue ($8.20) went gate-to-wire in Race 9, a $42,000 entry-level allowance for females 3 and older. The winning time was 1:45.31 for 1 1/16 miles over the Exceller layout.